Earlier this year we handed out seedlings to over 100 entrants to the second Kid’s Garden Competition. About two and a half months ago, the judging was done by two guests, Sue and Cajun, who run children’s permaculture competitions throughout the Eastern Cape. They had written ahead of their holiday to Bulungula offering permaculture services, and, since the plants were ready, this wasn’t an opportunity we were going to let slip by. I suspect that when we roped them in they had no idea that they were going to have to trudge all over the village for two days, up and down, followed by a snake of children. Over 70 of the entrants had managed to keep at least some of their gardens growing, despite hungry and determined goats. We judged these gardens taking into account the children’s ages, the quality of the soil they were working with, how many plants had survived (they all got the same amount), the health of the plants, and the state of the whole garden. We waited until after the school holidays to have the prize-giving, which eventually happened last week. The top six entrant received prizes of Mr Price clothing vouchers which ranged in value from R600 down to R100. On Saturday we piled all the winners of the into the Bulungula shuttle to take them to Mthatha to spend their vouchers. The start of the journey, up through the village, was punctuated with “Bye-bye’s” yelled out the window, “Bye-bye mama!”, “Bye-bye Vuyiseka!”, “Bye-bye!” to anyone within earshot. The rest of the trip was punctuated by the car-sickness of children not accustomed to being in a car, and the words “Yho!” (“Wow!”) and, “Intle!” (beautiful) every time we passed a truck or smart car. At one point, one of the boys made a particularly loud “Yho” as a black Mercedes passed by and then said, “I would turn around right now and go home if I could go in that!” But on my asking “Really?” he shook his head violently. The one pair of sunglasses in the group got passed around the shuttle; each one had a chance at wearing them. My sunglasses, and that of a guest, got some wear, too. Approaching Mthatha one of the boys authoritatively announced, “This is the centre of Mthatha”, since it wasn’t, he announced the same thing again a bit later, and then again a bit later, when we actually arrived. I am usually quite happy to help other people spend their money, but inside Mr Price it was a slightly more stressful situation than usual, as six children all tried to get their purchases to add up to their respectively won amounts. The top three winners, Pendula, Myberg and Nomfundo kept bringing their choices to me to ask if they had used their money up, and it took quite a lot of adding up sessions before they were eventually there, spot on, on target, so that they each had clothing to the exact value of their vouchers. The fifth and the sixth prize winners did a deal amongst themselves, which I would never have expected. 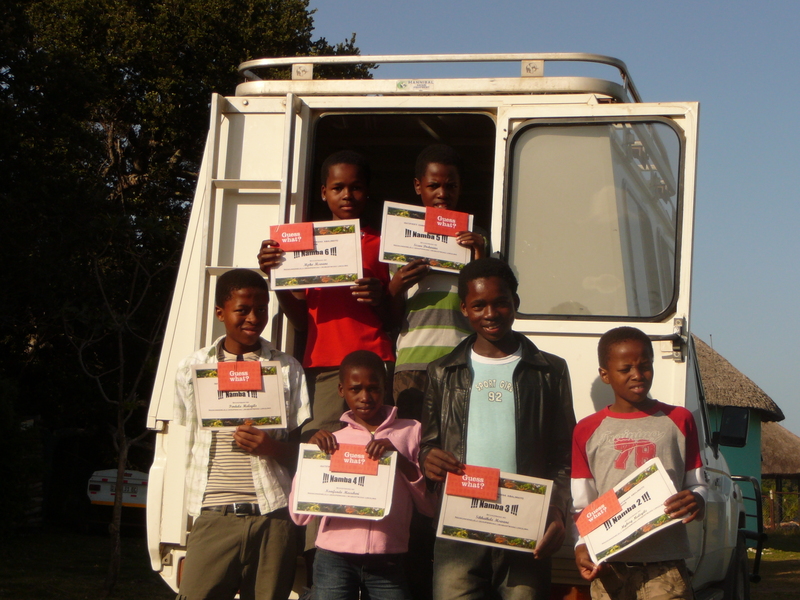 Mpho came sixth, and only had R100 to spend, but he was determined to buy school shoes. The only suitable black shoes in the shop cost R150, so Sikhathele, who came fifth and won a R200 voucher agreed to give Mpho R50 of his voucher. This meant that they each had R150 to spend. At the tills, though, we realised that the maths had gone a little wrong (maths has never been a strong point in the village, hence the school project). Sikhathele had chosen items worth R170. I wasn’t quite sure how to handle this situation, since it was Sikhatele’s generosity that meant he couldn’t buy the items for himself that he had chosen. It was Nomfundo, a very shy twelve year old (and the only girl amongst the winners) who worked out the solution. She had just paid for her goods, and found herself R20 up due to one of her items being on sale. She quietly tapped me and whispered, “They can have my R20, I don’t need another t-shirt”. In the end, then, two of the children each gave up some of their prize money so that Sizwe could get the school shoes he needed. This was done as a perfectly logical solution, and without any resentment. The spirit of the village has never been as patently obvious as it was to me as it was on Saturday, in Mthatha.